Background Bleeding is the main complication and cause of conversion to open surgery during laparoscopic splenectomy(LS). Today the main splenic pedicle is worldwild controlled by the endoscopic vascular linear staplers(ENDO-GIA). There are many disadvantages of this approach, such as high expense and pancreas injury. In the authors’ institution, a two-step technique has been developed to manage the secondary splenic pedicles with LigaSure. However, no previous study reported this technique and assessed its reliability. 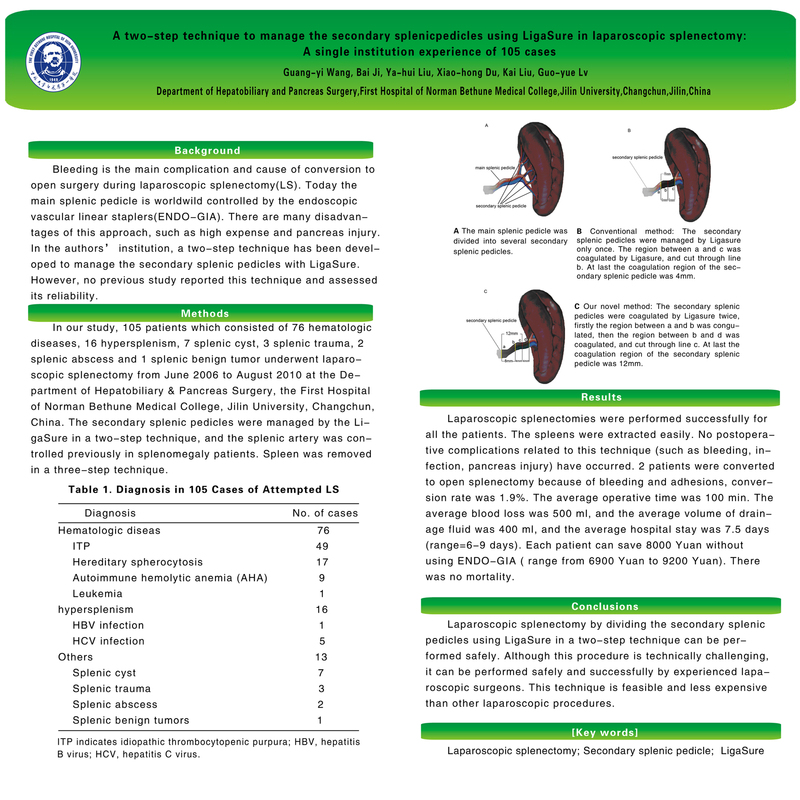 Methods In our study, 105 patients which consisted of 76 hematologic diseases, 16 hypersplenism, 7 splenic cyst, 3 splenic trauma, 2 splenic abscess and 1 splenic benign tumor underwent laparoscopic splenectomy from June 2006 to August 2010 at the Department of Hepatobiliary & Pancreas Surgery, the First Hospital of Norman Bethune Medical College, Jilin University, Changchun, China. The secondary splenic pedicles were managed by the LigaSure in a two-step technique, and the splenic artery was controlled previously in splenomegaly patients. Spleen was removed in a three-step technique. Results Laparoscopic splenectomies were performed successfully for all the patients. The spleens were extracted easily. No postoperative complications related to this technique (such as bleeding, infection, pancreas injury) have occurred. 2 patients were converted to open splenectomy because of bleeding and adhesions, conversion rate was 1.9%. The average operative time was 100 min. The average blood loss was 500 ml, and the average volume of drainage fluid was 400 ml, and the average hospital stay was 7.5 days (range=6-9 days). Each patient can save 8000 Yuan without using ENDO-GIA ( range from 6900 Yuan to 9200 Yuan). There was no mortality. Conclusions Laparoscopic splenectomy by dividing the secondary splenic pedicles using LigaSure in a two-step technique can be performed safely. Although this procedure is technically challenging, it can be performed safely and successfully by experienced laparoscopic surgeons. This technique is feasible and less expensive than other laparoscopic procedures.